Jack Hulbert was one of the most popular screen comedians of the 1930s, with a string of starring roles in British films, many of which were 'branded' as Hulbert vehicles. 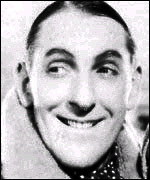 Titles such as Jack's the Boy (1932), Jack Ahoy (1934), Bulldog Jack (1935) and Jack of All Trades (1936) were markers of his polished knockabout humour contrasted with elegant song and dance routines. But Hulbert's career began in the theatre twenty years before; son of a doctor, he got the showbusiness bug at an early age, his brother Claude also following him into entertainment. Jack did a degree at Cambridge but his academic pursuits there were somewhat incidental, taking a back seat to performing and rowing, both of which he excelled at. After writing a hugely successful end-of-term student show, Hulbert was given his first professional job by theatrical manager Robert Courtneidge , acting in the show 'The Pearl Girl' opposite his daughter Cicely . She and Hulbert were soon married and went on to become Britain's most famous husband and wife comedy team. The First World War hindered their rise to stardom, and Hulbert joined up for the duration of the conflict, resuming his career immediately Armistice was declared. By then, his wife had established herself as a music hall star, though he quickly caught up by becoming a popular writer, director and performer of musical comedy. They mostly worked together, producing show after show with little time for a break. Despite their success, they found themselves heavily in debt in 1930 due to financial mismanagement and, thanks to an offer from Gainsborough head Michael Balcon , they embarked on lucrative film careers which enabled them to pay off their creditors. Cinema proved the perfect vehicle for Hulbert and throughout the 1930s he starred in a series of films which showed off his many talents. In each, he adopts a different trade - sailor, journalist, detective - and gets stuck into solving a crime, wooing a girl or both, with plenty of comic byplay along the way. His loose limbed style and versatility come across as he sings, dances and performs comic stunts in various guises, while also frequently acting as writer, co-director and choreographer. Film took a back seat during the Second World War, when he became a special policeman by day and went back to the theatre at night. His first post-war show, 'Under the Counter', about the wartime black market, was a huge hit in London but the transfer to Broadway was a disaster and the show closed quickly after scathing reviews. As he got older, Hulbert performed less and wrote and directed more but he still appeared in film, television and radio, often alongside his wife. They began to tour in straight plays and were still treading the boards in the early 1970s, although finding it a great contrast to their experiences in the more glamorous 1920s and 30s. The epitome of the theatrical trouper, Hulbert was ever looking to hone and polish his skills, as well as adding new ones to his repertoire. When not performing he would go and see other acts and shows to pick up comedy tips and learn news dance moves; his seemingly effortless gliding around the ice rink in Falling For You (d. Jack Hulbert and Robert Stevenson, 1932) belies the fact that he had only just learnt to skate. Despite the hard work he put into every aspect of his performance, he made it appear effortless and one obituary observed that he looked as if "he had stumbled by mistake through the stage door and was now strolling, with sleek fair hair and blue eyes and an apologetic chuckle, out in front of an audience."